Ever since I was young, I have always owned a sword. When I lived in Hawaii many years ago, I took classes in Iaido and fell in love with the Katana. A short time ago I decided to purchase a Katana I found on Amazon. Not knowing anything about the quality of the sword, I ordered one priced under $150. After receiving my new sword, I was shocked by its high quality. This was something totally unexpected. Usually lower priced swords are what I call “ornament level”. This one was heavy and fully functional…a real sword! Encouraged by that first sword, I ordered a second and higher priced one, again from Amazon. This one was over $300. It had the same feel of swords I remembered from Hawaii that cost over a thousand dollars. I was happy with my purchases but for two very important points. By purchasing on-line, I couldn’t hold it in my hands before I spent my money, and, as we all know, those pictures and reviews don’t always tell the truth (good or bad) or the whole story. As both swords lay on my display counter top, almost every customer, young or old, man or woman (mostly women) wanted to see and touch them. The interest was truly remarkable. I also found out that many of my archery students also take martial arts training and are starting, or are in some form, of a “weapons class”. In checking with “Mr. Google”, I found that there was virtually nowhere to find an actual sword dealer in Massachusetts. Oh, there are martial arts suppliers; but not one carried anything of really good quality. At this point, I made the decision to become a sword dealer for the same manufacturer I found on the Amazon site – Handmade Swords, and give everyone an opportunity to hold and experience a variety of real swords when considering a purchase. Baystate Archery is now a dealer for The Handmade Sword Company. Our stock consists of many of the swords found on Amazon; but mostly those you will not. 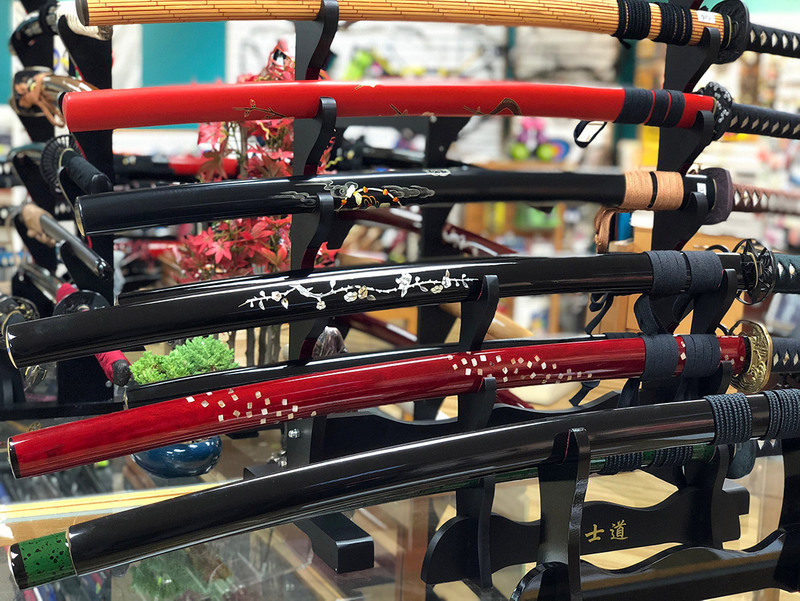 We have a complete line of “battle ready” Clay and Heat Tempered swords in 1045 to 1095 high carbon steel with blades hand-sharpened to Sharp condition, as well as lighter weight swords that are blunt edged for practice only. Most have the swordsmith’s signature from Japan and come with documentation. The higher priced swords come with their own sword case, cleaning kits and stand. We offer over 20 swords in stock, a line of Wakizashi’s (a samurai’s short sword) and Tantos. In addition, we have cleaning kits, sharpening whetstones, carrying bags, various sword stands, cases, tatami cutting mats and books. So if you ever considered a sword but didn’t know where to start looking for that real sword for Iaido/cutting practice, or one perhaps as a family heirloom, or to add to your existing collection… or just because you always wanted one, I welcome you to drop by our location and let one of our staff members introduce you to the greatest sword ever made… the Katana.